French Ingram Ranch – THE FINEST LIVE WATER OPPORTUNITY IN TEXAS! The historic French Ingram Ranch in Val Verde County, Texas has over 7 miles of crystal clear flowing Pecos River frontage. This very private ranch has been in the same family since the 1920s and includes a spectacular cut limestone home, custom built in the 1930s. The headquarters area is nestled in a beautiful valley with live oaks, conjuring up images of famed Texas Ranger Capt. Jack Hays stepping out to greet a visitor on the screened porch. This is an incredible year-round recreational ranch paradise that offers both hunting and fishing, not to mention exploring for Native American artifacts or pictographs and enjoying the stars at night or the daytime views of the Sierra Madre Oriental Mountains. Area Attractions and Location: The ranch is conveniently located near a variety of attractions and places of interest including Del Rio with restaurants, shopping, museums and the oldest winery in Texas, dating back to 1883. 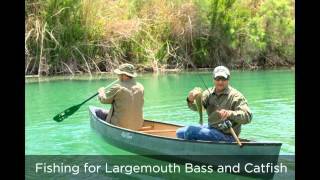 Lake Amistad offers some of the finest large lake bass fishing to be found in the USA. A visit to nearby Seminole Canyon State Park will enhance the new owner&apos;s understanding of the history of the area and the ranch&apos;s former inhabitants. The colorful tales surrounding Judge Roy Bean&apos;s "Law West Of the Pecos" make a quick trip to Langtry an interesting step back into early Texas. Specifically, the ranch is located about 8.5 miles north of Langtry, TX, accessed off of Pandale Rd. on the west side of the Pecos. This ranch features numerous access points to over 7 miles of the clear flowing Pecos River. It also has incredible topography for safari style as well as spot and stalk hunting throughout the ranch! The varied terrain features numerous canyons with many draws holding live oaks amongst other native fauna. Saddles and gentle slopes are covered with common desert species of brush, native grasses and succulents. Most parts of the ranch are easily accessible with the existing road system. Wildlife species that can be found on this ranch include white-tailed deer, mule deer, blue quail, turkey, dove, javelina, varmints and songbirds. The river provides fishing for largemouth bass and catfish. The Main House, located in the Headquarters area, was built in the 1930s and has been maintained in great condition. It is a spectacular example of a two-story classic Texas cut limestone ranch house with high ceilings and custom crown molding; three bedrooms, two full baths, hardwood floors, French doors and an incredible screened porch! Also in the headquarters area are two bunkhouses, a detached carport/quarters/storage building, a fully furnished enhanced mobile home, a shop and several barns. The ranch is fenced into 15 pastures for livestock management. Over 7 miles of Pecos River frontage, with access at numerous places, including one with a campsite. Not only does the river provide fishing opportunity (and habitat for wildlife), it also is great for canoeing, kayaking and tubing in a truly private and pristine setting. The ranch also has 5 water wells, 4 storage tanks/pilas and about 9 miles of associated piped distribution. The various wells, storage and distribution provide water to the headquarters facilities and some 25 plus troughs, providing water for wildlife and livestock alike. 3,200 acres have state classified minerals and the rights associated with such classification will convey to Buyer. Sellers owned minerals are negotiable; there is no production. The ranch has at least six known sites containing Native American Pictographs (Rock Art). The road leading out of the river in the ranch&apos;s Live Oak Pasture (named for the large live oak just above the river that has managed to grow and thrive seemingly out of solid rock) is also known as the Encino Solo Trail. In the early days of ranching in this part of Texas, the area ranchers used the Encino Solo Trail to cross the river and move their stock from pastures east of the Pecos to shipping points located west of the Pecos. Furnishings to convey except select pieces and some window coverings in main house. Multiple runway sites. Currently taxes assessed at Agricultural Value, where applicable. Price: Asking $9,122,750 or $650/acre. Disclaimer: The information contained herein has been gathered from sources deemed reliable; however, Republic Ranches, LLC and its principals, members, officers, associates, agents and employees cannot guarantee the accuracy of such information. The information contained herein is also subject to changes, errors, omissions, prior sale or withdrawal of property from the market without prior notice, and approval of purchase by owner. Prospective buyers should verify all information to their satisfaction.